A long long time ago in a Marvel universe far far away (the 80's) the son of Mr. Fantastic and The Invisible Woman was a little boy whose future looked ominous. Every now and then a sinister look would cast over his face and destructive energy would emerge from his eye sockets. What kind of offspring was this, produced by the union of two people exposed to mysterious radioactive rays? Years later we finally have the answer. 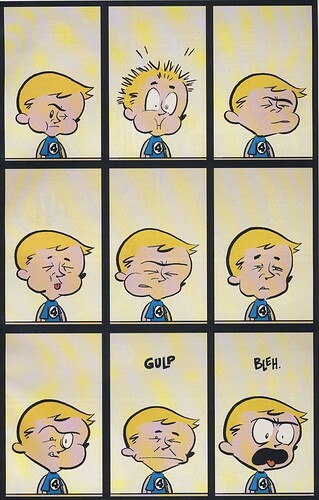 Franklin Richards is Bill Watterson's Calvin. A red haired boy genius brimming with curiosity and demonstrating a destructive streak. His Hobbes is that leftover from the 70's cartoon series HERBIE The Robot. Together they get up to all sorts of shenanigans in the Baxter Building while mom and dad are off fighting Annihilus in the Negative Zone. It's a fun idea but it could stand to be a bit less derivative. The more blatant attempts at aping Calvin & Hobbes serve only to remind readers that they could be reading Calvin & Hobbes instead. As a back up feature in The Fantastic Four, Franklin Richards worked well. The stories are fun but slight. Unfortunately the standard floppy format doesn't work well for this material. The art is too simple to fill the traditional six panel spread. Since there's not a lot going on kids will burn through an issue in less than five minutes. I recommend it, but try one of the digest compilations. The smaller format suits the art better and you get the most for your money. Man, I saw that image and almost got all FFF about it, but then I figured your text would mention a "tribute" to Calvin and Hobbes by the staff of Franklin Richards. But you didn't. So it's just a verbatim recreation of one of my favorite Calvin and Hobbes strips.